My father grew up in Sheboygan, Wisconsin on the shores of Lake Michigan. My grandfather was an Irishman from Chicago, stationed in Sheboygan during the Second World War. He fell in love with the order and beauty of the place. He loved the pristine Germanic neatness of the town on the lake, the lawns clipped and swept and groomed and the houses bright and painted and trim, the children well behaved. Luckily for him he also fell in love with my Czech grandmother, who was able to help him live as much like a German as an Irishman ever could. This meant he was priveleged to consume the most incredible bratwurst known to man on a regular basis. My grandmother is an amazing woman. She is bright, stylish, well read and informed regarding the issues of the day, and an impeccable hostess. Her home is immaculate and welcoming. She turned 92 last month. Luckily, we were able to visit her and spend some time in Sheboygan back in June. The Sheboygan area was settled by German’s in the mid-1800’s, and retains a strong Germanic flavor to this day. Every summer, the town hosts a Bratwurst Festival and boasts the best brats in the land. Johnsonville brats are made in Sheboygan County, in a town just a few miles away. The best bratwurst in the world, however, is definitely made in my Grandmother’s backyard. On this visit, I felt that it was crucial that I learn how to make my Grandma Dorothy’s Sheboygan Style Brats. Luckily for me, she had just purchased a couple dozen Johnsonville brats on sale. That is the first step, she told me. Wait for a sale, and then load up on the Johnsonville brats. We are going to grill these in a moment, but first we will prepare the crucial marinade. For 12 brats, you will need one large white onion and a stick and a half of butter. Slice the onion in half, and then slice lengthwise. 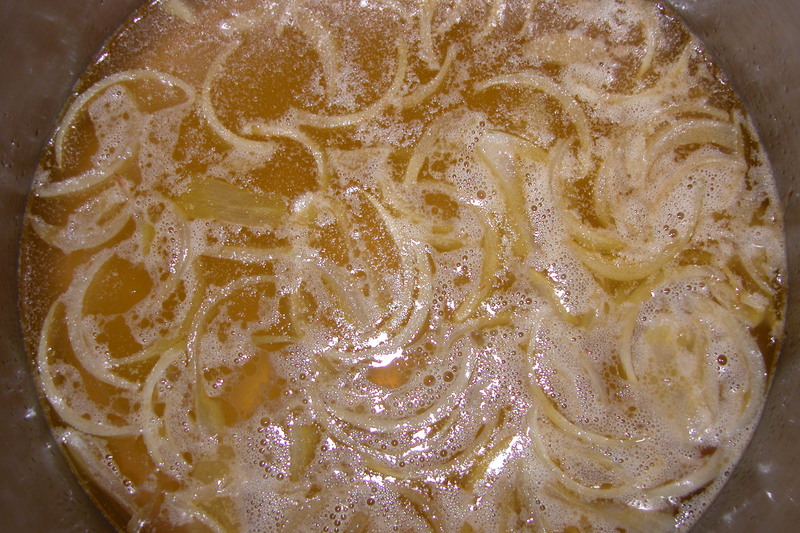 Melt the butter in a deep saucepan, and then gently saute the onions on medium low. You just want to soften them up a bit. As soon as they have softened slightly, pour in 2 cans of beer. Yes, cans. You may be a sophisticated bottle beer drinker, but the beer we are looking for here is a light, Milwaukee style canned beer, not a deep dark bottled malty fancy shmancy beer of any sort. 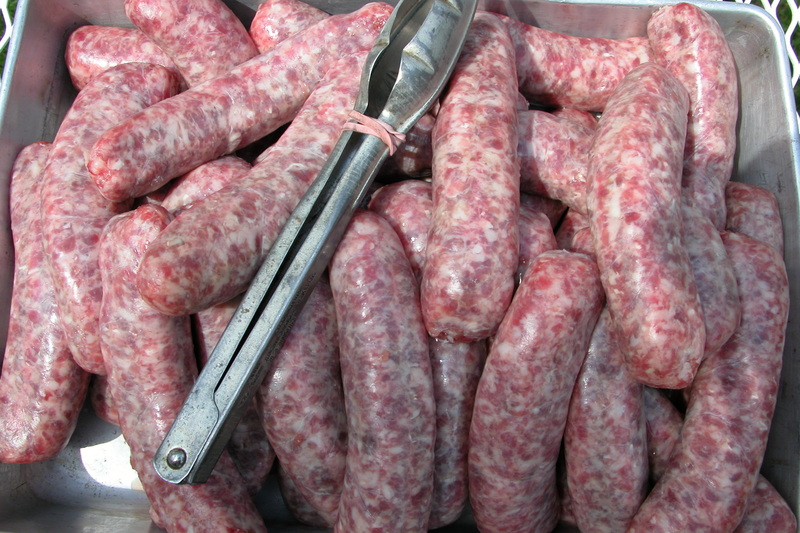 Remember that you are making Wisconsin beer brats. Try Miller, or Pabst. Turn the buttery beer down as low as it can go and leave it on the burner while you head out to your hot grill- preferably your charcoal grill. 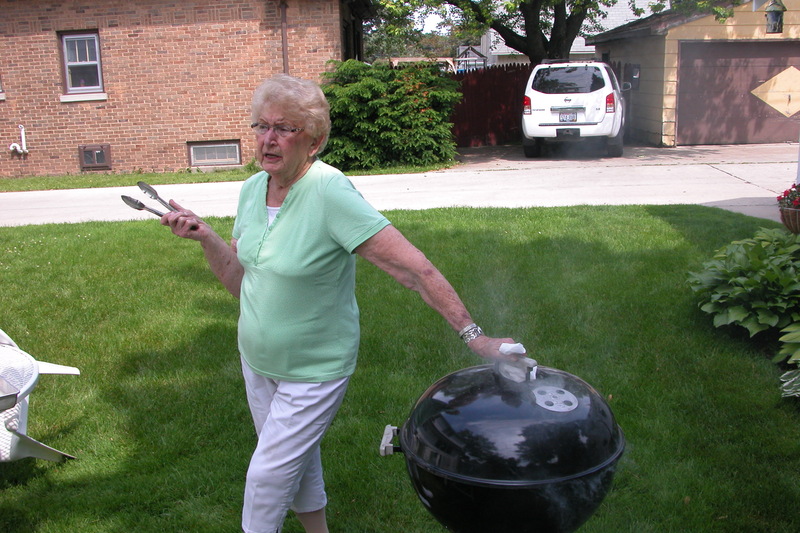 Grandma recommends a classic Weber grill. 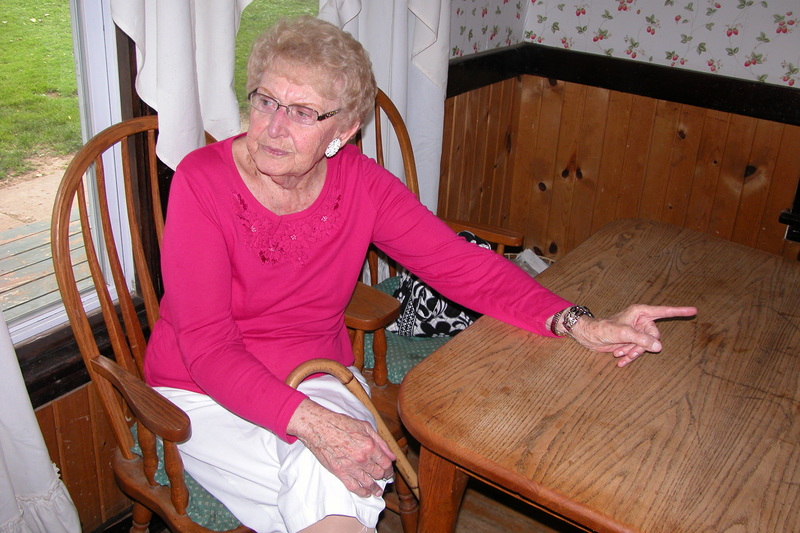 She has been grilling brats for about 70 years, so I tend to respect her opinion quite a bit. 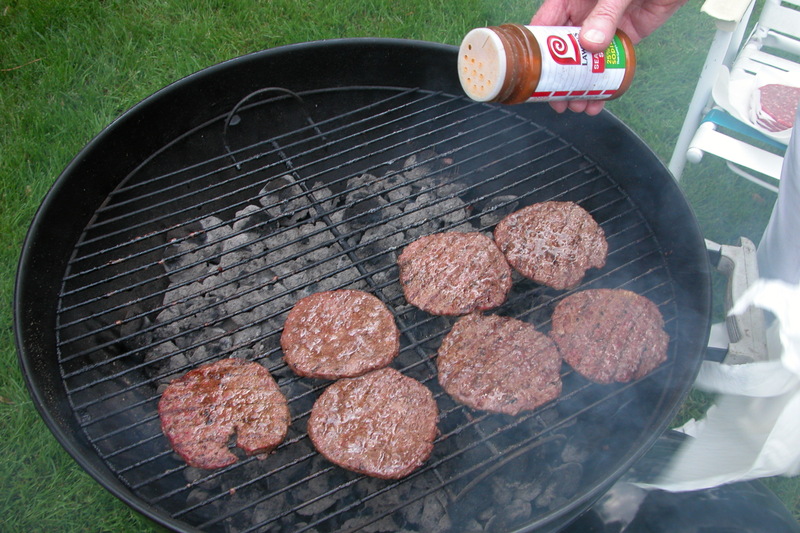 You can throw some patties on the grill as well. 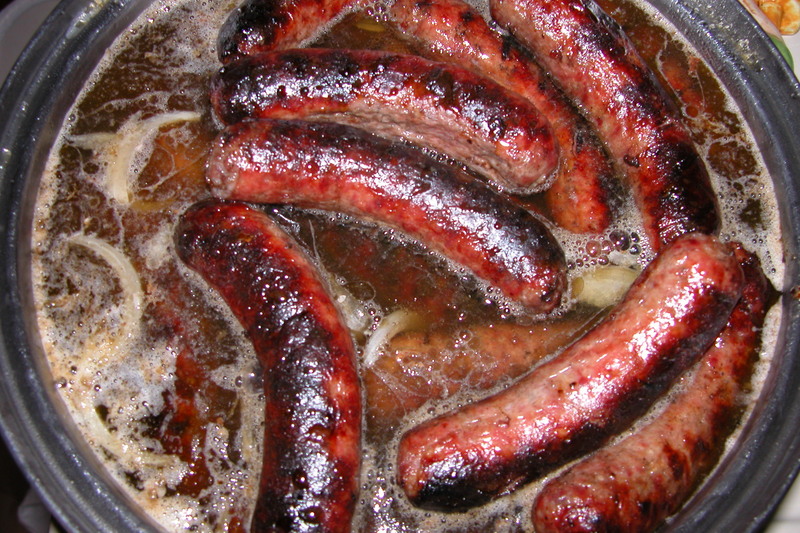 Hamburgers love the buttery beer brat marinade as much as brats do. 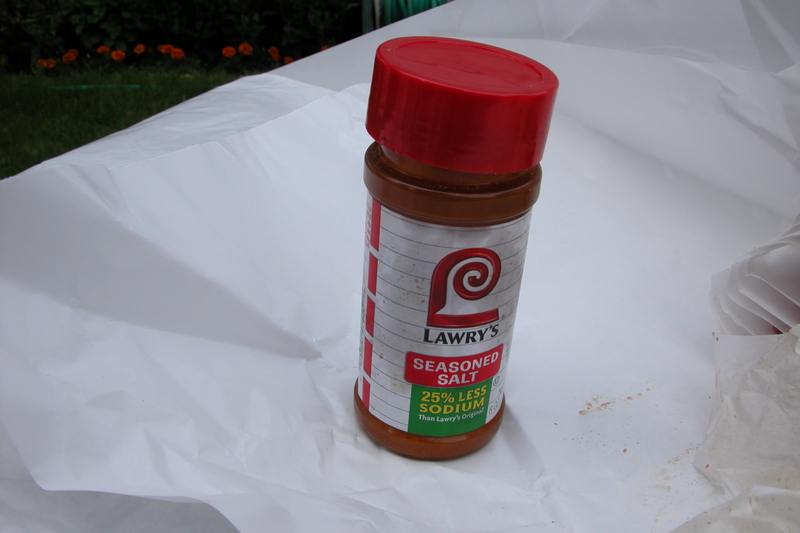 My grandmother dusts her hamburger patties with Lawry’s Seasoned Salt. As soon as the brats and burgers are done grilling, they are ready to meet their match. Pull them off the grill, bring them into the kitchen, and place them one by one into the (still bubbling) beer, butter, and onion mixture. Turn off the heat entirely and let them luxuriate in all that beer and butter. And here’s the thing. You can pull the brats out, and put them on buns. It would be best if you had these incredible rolls from the German bakery down the street in Sheboygan, but if you don’t you can make do. You can slice the rolls and butter them and place them on a tray and slide them into a hot oven for a little while, like my Grandma does, and pull them out when they have reached the point of perfection. This sounds like it is leading to a picture, but I don’t have one because at this point my documenting ceased and I ate a couple brats. 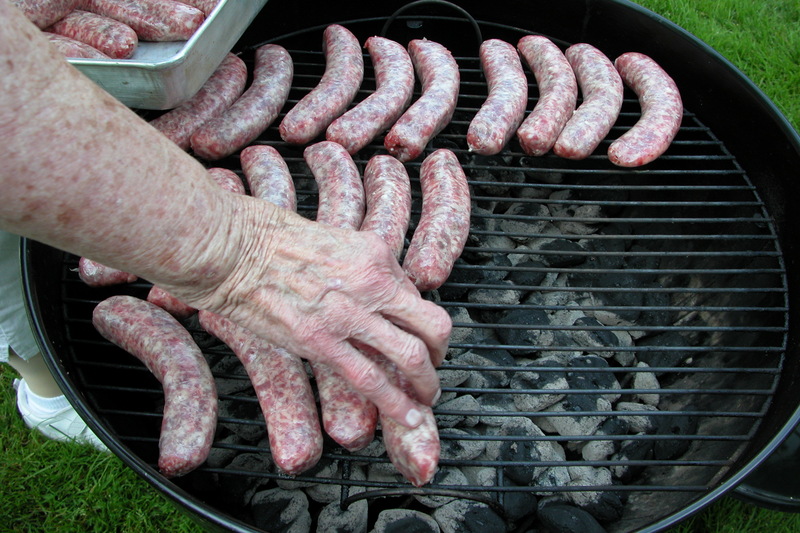 If you eat the brats now, they will not really be my Grandma Dorothy’s Best in the World Beer Brats. That is because she generally makes a massive batch to prepare for the future hordes of Slattery grandchildren, so she lets the batch of brats in the beer marinade cool, and then she gets out a few gallon sized freezer bags. She places four to six brats and a couple burgers in each one, and she pours a cup or two of the marinade over each of them. 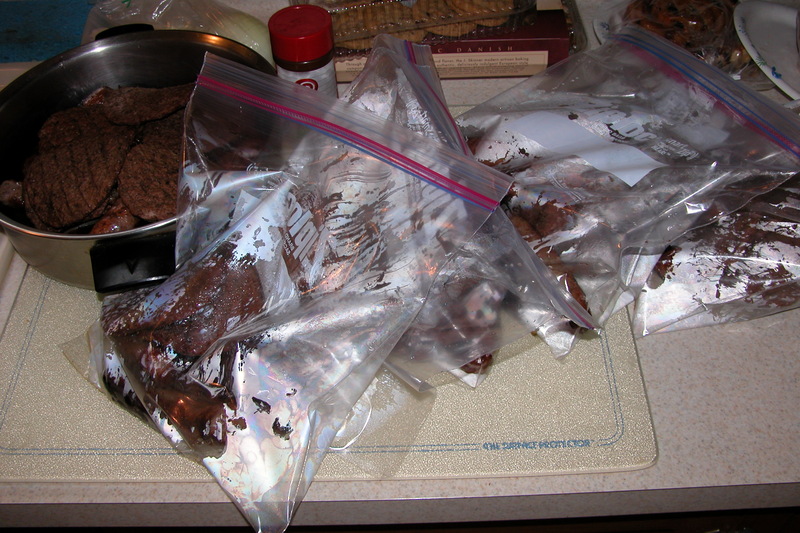 Then she sends all these bags down to the freezer in the basement, lays them out carefully so they freeze evenly. She pulls them out when the grandchildren or great grandchildren come to town, or in the middle of the winter when it is important to taste a bit of summer. She sent a bag with me on my way back to Pittsburgh. I pulled it out of the freezer a couple days later and heated up the brats gently on low heat in a cast iron pan. The time the grilled brats spend marinading in the beer and butter mixture adds an amazing complexity and richness to their flavor. This is definitely Casey’s favorite summer lunch. I highly recommend the process. You’ll be glad you tried it. Butter and beer and bratwurst- you can’t go wrong. Try it, and let me know how it goes! Slice the onion in half, then continue to slice lengthwise. Heat butter slowly in deep skillet and saute onions gently till soft. Pour in two cans (or more if you’ve got more brats) beer and leave on lowest heat to barely simmer. Grill brats, and Burgers if you’d like. 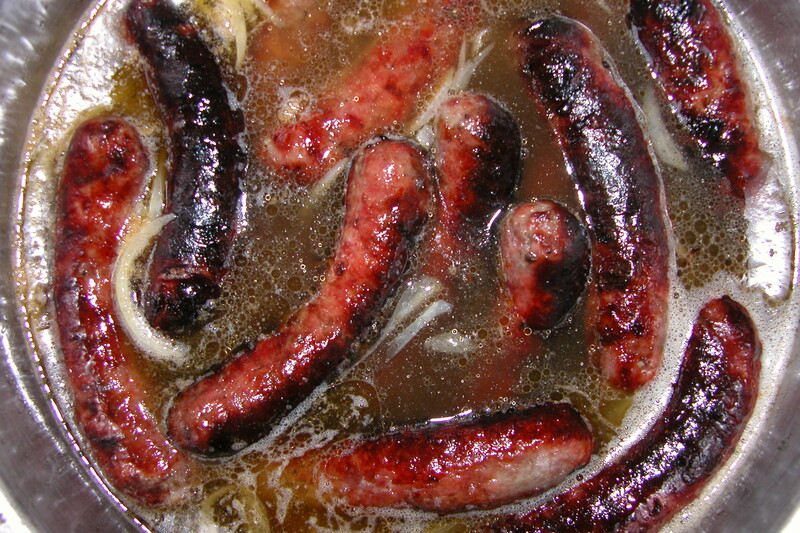 Drop brats into beer, and leave to marinade till cool. Bag up the brats in gallon size freezer bags, pouring 1-2 cups marinade over each batch. Freeze until you need them. Pull out brats and burgers and frozen marinade, and heat slowly. Serve with fresh onions and mustard on a sliced, buttered bun slightly browned in the oven. Enjoy. This entry was posted in Kate, Uncategorized and tagged beer, Brats, Family, Recipe, summer, Wisconsin on July 27, 2011 by sweetridgesisters. Sounds incredible! I really love this post, I think it’s because you are sharing a very old, traditional recipe from your Grandmother. Love. Thanks, Veronica! It is a great recipe- surprisingly easy, and amazingly good. I am grateful to have done the whole process with my Grandma last month. After slicing our hardrolls, we very gingerly touch the cut side to that luscious marinade and then add brats or burgers. A bit messy but heavenly flavor. We don’t have an outdoors grill, but I’m going to try this just using my cast iron cookware. It looks amazing, and I feel the need to pay some tribute to my Wisconsin roots. And 92?? Really?? She looks amazing. May God bless me with an alert mind until the end as well! I experienced these when I visited Sheboygan with a friend in 1972. I’m from Alabama, but thought I had died and gone to heaven. It wasn’t a grandmother, but a friends Dad that opened his house and welcomed us. He fed us grilled brats and beer. An experience of a life time. I still make them for my friends and family to this day. Probably the first online Sheboygan Brat recipe that got it right! Living in Sheboygan has its perks and this is the best one by far (except I prefer Meisfelds “grand champion” Brats). I fry-out all year long no matter the weather or temp. That is a high compliment indeed. Thank you sir. My grandmother passed on peacefully over a year ago but her recipe and legacy love on. True recipe. Just substitute Miesfeld’s (also from Sheboygan) for Johnsonville. Huge difference. Hard rolls from City Bakery are a must! Try the Great Value Store Brand Brats from Walmart. You will be surprised. They are the same as Johnsonsville and cheaper. Yeah. Cause Johnsonville makes them!!! I’m from Sheboygan, and this is EXACTLY how we do it! Delicious! Did she use City Bakery, Johnson’s or Westside (Fuzzy the baker)? Yes! This is how it was done by my dad, born in Sheboygan in 1919. There is an art to grilling the sausages (not my expertise) but because Germanics are forever cognizant of health and food safety, the brats (pork) would steam and continue to cook in “Beer Juice” just in case a novice working the “bratwurst fryer” (charcoal grill) accidentally hurriedly undercooked any brats. Never listen to anyone from Milwaukee who insists on boiling the brats before grilling. No, no, no. Also, traditional garnish for Sheboygan Brats on a buttered hard roll is Dusseldorf (brown) mustard, raw mild onions (and/or onions cooked in beer juice), sliced dill pickles and (maybe) ketchup if you like it. Years ago when living in Florida I discovered that a French baguette has a crispy crust and fluffy interior similar to Fuzzy’s hard rolls. 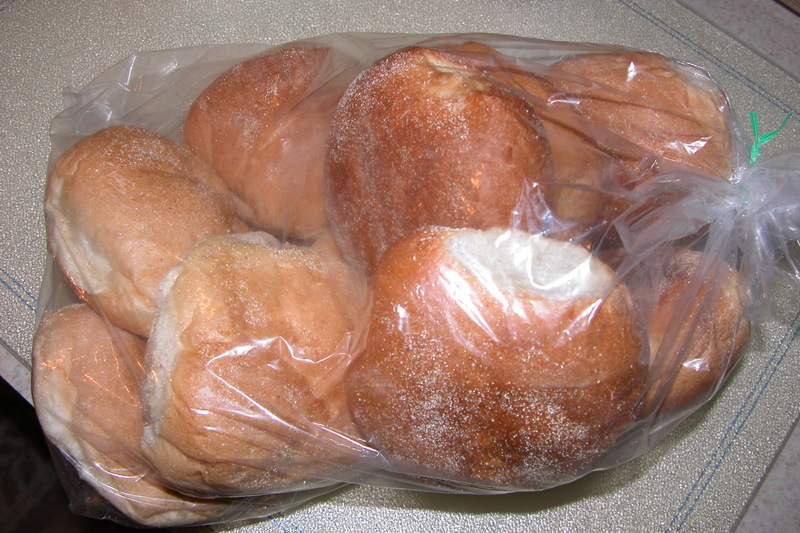 Definitely a better substitute than hot dog buns, kaiser rolls or “brat buns”.